New research suggests the rabies virus uses a snake venomlike compound to manipulate infected animals. 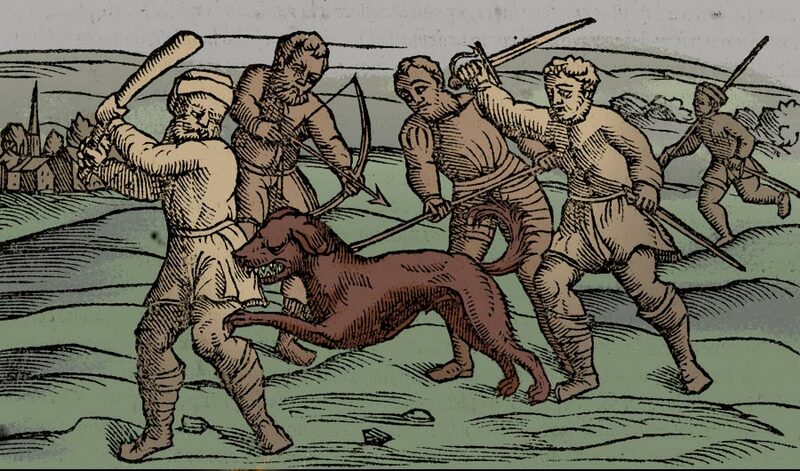 Men attempt to kill a rabid dog in this adapted 1566 illustration. (Inside Science) -- Rabies has struck terror into human hearts for millennia. Friendly dogs and shy wildlife turn ferocious under its influence, spreading the infection through frothy-mouthed bites. And while the virus doesn't typically make humans bite, it can cause disturbing behavior changes, some of which are eerily reminiscent of vampire legends. In fact, researchers speculate that rabies may have helped inspire stories of vampires and werewolves. But the way the tiny virus exerts its influence has remained largely mysterious. Now, scientists have demonstrated for the first time that a fragment of one of the virus's proteins can alter animal behavior by blocking key chemical messengers in the brain. In a new study, that fragment alone was enough to halt the pumping of worms' digestive tracts and make mice run frantically around their cages. "We took a very, very small piece of the rabies virus, and we could change behavior with that," said Karsten Hueffer, a veterinary infectious disease researcher at the University of Alaska Fairbanks and lead author of a study published this month in Scientific Reports. "This was really the first time that we have a mechanism from the virus side of things that changes the behavior of a host." Rabies essentially turns its primary hosts -- carnivorous mammals like dogs, wolves and sometimes bats -- into machines for passing the virus on. Such species become bold and highly aggressive when infected, attacking creatures they would normally flee. They also lose the ability to swallow, making their mouths overflow with infectious saliva. Humans are akin to dead ends from the virus's perspective, usually dying without infecting anyone else. Thus, the behavioral changes in human patients are probably collateral damage caused by our similarity to other species, not active adaptations to help the virus, said Hueffer. Nevertheless, the most common course of illness, known as "furious" rabies, makes people behave in extreme and disturbing ways, often with faces pulled into terrified grimaces, said Thiravat Hemachudha, a neurologist and rabies researcher at the Neuroscience Centre for Research and Development and Chulalongkorn University Hospital in Bangkok, Thailand, who was not involved in the study. Hemachudha said he has personally treated 150 infected people. "They scream. They shout, and they overreact to any stimulus -- light, sound," he said. "It's very horrific." Hemachudha calls rabies the "king" of viruses because it kills nearly 100 percent of its victims. Once the infection has taken hold, all doctors can do for such patients is try to soothe them -- a task that may involve up to 480 milligrams of intravenous valium per day, 96 times the dose that would send most people straight to sleep, said Hemachudha. Hemachudha is skeptical of theories that rabies inspired vampire myths. Nonetheless, some of the same stimuli that can make infected patients cry out and spasm are also rumored to ward off vampires: water, strong scents like garlic, and the sight of mirrors, according to a 1998 paper in Historical Neurology. The disease also causes insomnia and may lead people to wander at night. In rare cases it triggers intense sexual desire. Top that off with transmission by bites and associations with bats and wolves, and it's easy to see why some people would link rabies to the bloodsucking monsters of legend. With some neurological illnesses, it's clear why people or animals behave strangely. Mad cow disease leaves a network of tiny holes through the animals' brains, and Alzheimer's disease makes sticky plaques build up between nerve cells. But rabies only causes subtle changes to brain tissue, said Hueffer. A pathologist examining a rabid animal's brain would note some inflammation, but wouldn't immediately see anything extreme enough to account for the creature's bizarre behavior or death. That suggests that the virus alters host behavior by hijacking biological systems already in place. One likely candidate is a type of receptor on the surface of cells that binds to a chemical, called acetylcholine, that neurons use to send messages. Acetylcholine has a wide range of roles, including allowing nerves to communicate with muscles and control voluntary movements. In the 1980s, researchers discovered that the rabies virus uses acetylcholine receptors to enter muscle cells at the site of a bite, later traveling up the peripheral nerves and into the brain. The virus latches onto the receptor using a short string of molecular subunits called amino acids. This amino acid sequence, known as a peptide, is almost identical to certain snake venoms, presumably because they both evolved to attack the same parts of animal cells, said Hueffer. More recently, researchers have found that the rabies peptide can also bind to receptors in the brain, where acetylcholine controls processes such as arousal and attention. But in the past, said Hueffer, such research has largely focused on how the virus uses the peptide to crawl inside neurons to replicate. Hueffer and his colleagues suspected that the venomlike string of amino acids also plays a direct role in the disease's terrifying symptoms. First, the researchers experimented with acetylcholine receptors in a dish, and found that the peptide blunted their reactions to acetylcholine. Next, they gave the peptide to nematode worms, which feed through pumping actions controlled by acetylcholine. As predicted, the peptide made nearly all the worms stop eating. Finally, the researchers injected peptides directly into mice's brains. There was no reason to assume that the mice would act like rabid dogs, since mice aren't a typical host for rabies, and in any case the peptide is probably just one of several ways the virus controls host behavior, said Hueffer. Thus, Hueffer and his colleague Michael Harris had no idea what to expect when they placed the first two mice -- one that had been injected with the rabies peptide, and one that had been injected with a control peptide -- in separate enclosures, then retreated to watch through video monitors. "We literally sat in the hallway having mouse cinema for hours," Hueffer recalled. At first, both mice acted the same, running around and exploring the new environment. But after about half an hour, the mouse that had not received the viral peptide went to sleep on a patch of gauze. The other mouse showed no sign of slowing down. "This one mouse that got the rabies peptide just kept on running, while the other one was literally curled up just like a puppy on a dog bed," said Hueffer. "I said, like, 'Mike, this mouse -- it's different.' … We were really kind of giddy." Later experiments confirmed the pattern, with mice exposed to rabies peptides showing more activity than controls. The behavior change was consistent with rabies symptoms, which include hyperactivity. Hueffer said that in the future, he would like to conduct different trials to test for anxiety and aggression. Rabies kills tens of thousands of people per year, nearly all in poor regions of Asia and Africa, according to the World Health Organization. Understanding its mechanisms of action could eventually help researchers develop treatments for rabies victims, and perhaps battle related types of viruses such as Zika and West Nile, said Hemachudha. Hemachudha doesn't regard the new study as groundbreaking, pointing out that past research already indicated that the virus manipulates acetylcholine receptors in the brain. But Hueffer said that as far as he knows, this is the first direct demonstration that those manipulations change behavior. Hemachudha also said that mice may not be the best study organisms for rabies, since they are not the virus's primary hosts. But Janice Moore, a behavioral biologist at Colorado State University in Fort Collins who was not involved in the study, said it made sense to use mice as a first step. In addition to being cheap and easy to work with, lab mice are well-studied and bred to be genetically similar, making it easier to tell what's causing what in an experiment. The rabies virus is one of a diverse suite of microbes and parasites that manipulate the behavior of their hosts for their own benefit, Moore added. In fact, researchers are only now starting to appreciate just how many parasites act like tiny puppeteers. "I find this very beautiful, in a creepy kind of way, how these viruses do that," said Hueffer. His own discoveries with the rabies peptide may offer a rare chance to see the puppeteer's strings.